In simple terms it is a martial art founded in the mid 1920′s by Morihei Ueshiba based on the principles of harmony and expression of love for all things through budo. Recognized by the Japanese government in 1940, the Aikikai Foundation is the parent organization for the development of Aikido worldwide. In deeper more complex terms Aikido training allows the human spirit to develop itself by unifying ones body mind and spirit. Through time, Aikido training will skillfully strike down one’s ego & inherent insincerity through the discipline in the martial techniques in Aikido. The ultimate goal of Aikido is step by step improvement of one’s character based on the rules of nature. So we “become resilient and strong inside but express our spirit’s strength softly. In the natural world we find efficient, rational and soft movements, while inside you will find the immovable and firm center. This concept makes it possible to defend one self against an opponent of superior strength & size. Aikido movements may seem circular and soft on the surface but with some application of force Aikido can be devastating in nature. Through understating of this principle one can have physical exercise, gain spiritual development and learn proper etiquette and behavior to all humans one encounters in life. 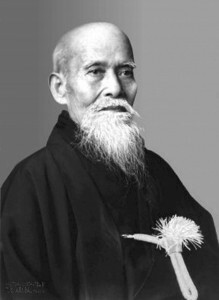 However, Ueshiba (commonly’ called O-Sensei, or “venerable teacher”) was determined that his Aikido be practiced as more than simply methods of fighting. The Japanese martial arts influenced by the internal and meditative disciplines inherited from India and China, have often carried with them an emphasis on the development of internal as well as physical integrity. Wielding the life-taking sword with compassion and insight, the ideal warrior in Japanese thought is more than a simple killing machine; he is a model of uprightness, courage and loyalty, gladly sacrificing life (but never honor) in the name of principle and duty. Steeped in these traditions, O-Sensei conceived of Aikido as not only a means of vanquishing a foe, but as a means of promoting the positive character of the ideal warrior and ultimately of transcending dualistic conflict. For O-Sensei, Aikido was a path of self- development. He believed that it could be a means for anyone, of any nation, to follow the same path. Aikido is shugyo: an intense physical and spiritual training to perfect human character and develop true wisdom. More than any technique, it is this spirit of shugyo which defines true Aikido training. While technical mastery,’ is essential, without these philosophical principles Aikido would be nothing more than exercises and throws. As you train, keep these concepts in your mind. Eventually they must fall away as concepts, and become a part of you.